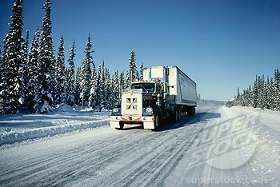 Are you forced to drive in bad weather requiring snow chains by companies you work for? Heavy C, not pushing through inclement weather will not make them think any differently of you. Its not worth it for the company to risk losing hundreds of thousands of dollars just to get a load in on time. They can always reschedule. Pushing through inclement weather is just about the worst thing you can do on the road in my opinion. Driving in conditions that are dangerous will eventually end your career and maybe even your life. Would you really risk your life for boxes of macaroni and cheese? I sure as heck wouldn't. Those boxes can wait a day. At the end of the day my goal is to be alive to be able to support my family. And I won't risk my family losing me just to prove to some guy at a desk that I'm reliable. The company also doesn't want you to push through inclement weather. They have enough accidents each year and they want to avoid as much as possible. So please, everyone reading this. Do not think that you're any less of a driver for stopping when conditions get ugly. If anything, you're a better driver than the guy going 60 mph who will get his load in on time but risk everything in exchange. The good drivers are the ones who use their head. I will drive through rain. I will drive through snow. I won't drive through a blizzard and I won't be driving if I'm required to put on chains. In all honesty, I don't think we get paid enough to put on chains and drive down a steep grade with 79,000 pounds behind our backs. I won't drive if I feel like I'm risking my life. I'm 22 and have a bright future with a wonderful wife, no way I'm going to risk losing what I am blessed with just so walmart can have their product. The more strict you are when it comes to safety then the safer you'll be. Ronald, in the end the person who makes the decision is you. You're the captain of the ship and what you say goes. Your DM has absolutely no say in whether or not you should or shouldn't drive. Drive when you feel comfortable. Go ahead and drive 15 mph with those chains on while they tear apart your tires. You'll be wasting your 70 driving and making no money in return. Ill be in the truck stop sipping my hot tea talking with my family and watching TV. Meanwhile you'll be holding onto the steering wheel with your life. I want to go the extra mile here. I want you to know what you'll be getting paid with those chains on. Lets say my trucks maximum speed is 60mph and I get .30cpm. If you do the math, they means if I drive exactly 60mph nonstop for a full hour I will make 18$ per hour. Now lets say you decided to drive with chains on. A safe speed is about 20 mph so lets use that with the same pay. So if you drive with chains on going exactly 20mph for a full hour nonstop. You will have made 6$ for that hour. Lets no forget those hours spent wrestling with those chains. You also wasted time off your 70 hour clock. You risked your life, wrestled with heavy chains, just so you can make 6$ per hour. So I ask. Who is the fool and who is the wise one? The one who sat comfortably at the truck stop or the one who is so determined to get his load in on time so he can be viewed as dependable meanwhile risking his entire life and career. Like Brett always says. If the weathers terrible today, chances are tomorrow morning it'll be clear and perfect for driving. So why not wait? I hope I made my point. If you don't feel safe driving, then don't drive. One question. Brett, how many times did you put on chains in your entire 15 year career? We need pics! Send us some pics! Congratulations Wick, drive safe out there :) ! I'm glad you're sharing your experiences because we can all learn a lot from you. I think you will probably go quite far! Hello Heavy C Thank you for the realistic information post, you hit it on the head, if people rely on "reviews" as the only piece of information to make decisions on, well, they're getting off on the wrong foot. I happen to look at some reviews online of a hotel in St Louis Mo. The reviews were horrible, well, when I was in St Louis I checked the hotel out. To my surprise the hotel was a 5 star location and was outstanding in service. So I don't know about the bad reviews, they were wrong. I also checked some reviews online at a couple of hotels in San Diego Ca. same thing happen. In a business meetup in Champaign IL I attended, focus was marketing for business, a co-peer told me that competition gets down and dirty and deliberately post negative feedback to push people away from them and toward the other, in this case hotels. Also, you might have a disgruntled ex-employee, which will get on the review sites and post horrible reviews. Everything in life no matter the opportunity, takes the individual putting they're time and effort into the situation, if people put a small amount of time into something, that's just what they will get out of it. I have a friend, who always wanted to have a business, make a lot of money but put a fraction of time into that business, well, needless-to-say that never happened. We've heard the expression "you are what you eat" well, you'll only get out of something what you put into something. Hmmm...."screw this load I'm not driving !" is a bit harsh, I would have grabbed the load and headed toward the destination, now, I would try to focus for on-time delivery, but situations such as being a "ROOKIE" because of road construction, wrong turns or traffic and weather delays the load might be late getting to destination. However, I wouldn't say "screw this load I'm not driving !" in my past years of conducting business in some different business industries, which focused on customer service and satisfaction I never said screw the customer. I laugh at myself and you can too. Hello Big Scott Thank you for posting the information, something to look forward to. I just obtained my CDL permit, I need all the information I can grab so I can expect the worst. I was thinking I hope I don't make a mistake, didn't want the trainer to get mad. Hello Trucking Truth I'm glad I found this thread, boy, if the guy got fired in training, I'm a little leery about learning to drive a truck :( might have to switch my interest, I thought it would be a challenge and interesting opportunity but if there are possibilities of being fired on an oversight especially in training, that's harsh not worth the hassle, I mean we're all only human. CDL in ILLINOIS costs $50.00 I think I'm putting the cart before the horse because I'm taking my tests CDL/endorsements first, I sent another message but forgot to enable the "Notify Me Of New Comments"